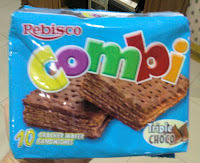 Combi brands of biscuit is a new variant from Rebisco (Republic biscuit corporation) , Philippines . Crackers with cream filling has been around for some times but Crackers with wafers is something unique and is liked my consumers . Crackers shell wrap wafers in between giving you crispness and taste . Established in year 1963 the group has grown to be the leading biscuit manufacturer in Philippines.Along with subsdiary Suncrest which manufactures cakes Rebisco group dominates the Philippines bakery market .